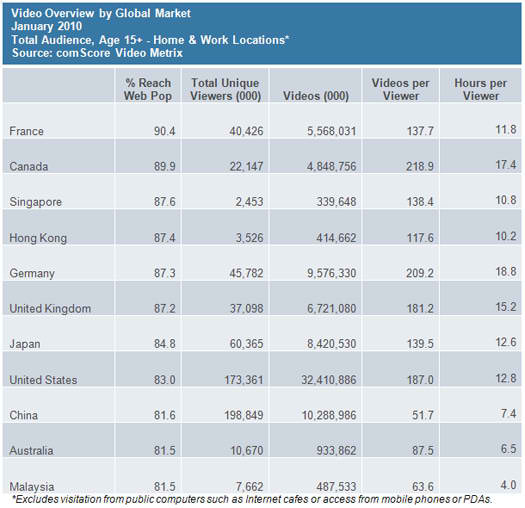 I have often discussed the growing demand for watching videos over the internet, so it was with interest that I read the recently published statistics from comScore. The volume of videos watched is huge, and it must be rememberd that this is largely because the length of videos watched online are often only 5-10 mins. However, the hours per viewer number indicates just how powerful this medium is going to be in terms of audience attention. What amazes me is the high percentage of brands who don’t have video included in their digital strategy. Usually this comes from an ignorance of the size of this medium. Most decision makers in marketing teams, or their agency don’t spend a lot of time online and are often unaware of the changing habits of the online consumer. Secondly, they often assume that producing video content has to follow the same expensive process used to produce television commercials. This means that someone has to swim against the tide, and often actually start publishing video content to initiate a change in focus. So I’ve listed 5 initiatives to get ways to help you get this done. 1. Research what content exists for your category. 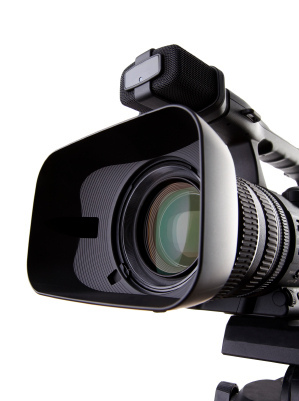 Video should be something that is monitored along with your Social Media Monitoring process. Understanding what video content is available helps to narrow down and discover more about the market that is vying for share of attention. It’s a good idea to group the content into sub-categories so that you can more easily digest this. Identify the opinions being expressed, and list any topical gaps or areas where your stories will rise above the clutter. Here’s a selection of video search tools that will help. Outcome: Research report on video content for your category. Hidden away in corporate shelving, or archived sales conference video tapes are some great content that provides an easy source of material. Most agencies are quick to upload your tv ads, which should not equate to ticking the box on internet video. Consider enhancing the content of your ad, by uploading the back story to the ad itself, or extending the content of a 30 sec spot into a 10 min spot. This is why it’s important that television ads incorporate a digital execution strategy. Even if you intend using professional resources to record video content of major events, conferences etc, I still recommend purchasing some basic video equipment which is available for ad hoc opportunities like interviews, testimonials from passionate fans, or technical explanations from your R&D people. I still remember buying one of the early digital camera’s for a consumer packaged goods company that I worked with, and it stored the pictures on a 3 inch floppy drive. Once people started seeing how easy it was to record & share images, the camera soon was constantly in demand. The point is that sometimes change requires demonstation & experience. Thanks to advances in technology, and global competition, it doesn’t cost very much to get the basic video equipment these days. Portable video recorders like the Flip video, Sony’s Bloggie, or Kodak’s Zi8 start at around $150. HD Camcorders can be purchased for less than $1000 making it relatively easy to purchase as a business expense. Video equipment is also easier to use and many of the new devices include an integrated upload to youtube facility. Having the equipment on hand lets you experiment and start to learn the basics of video production. There are so many existing areas that brands invest in, and unless there is a legal or copyright reason not to, we suggest that they make a great starting point for getting experience around this medium. Whether it’s an internal speech made to employees, or a trade show exhibition that you have invested in, you can help extend the life of these events using video recording. If also helps to showcase some of the content you record which helps to encourage others to utilise video as a part of business communications. Outcome: List of easy opportunities for video content, quick win case studys that can be used for a business proposal. Once you have completed the first 4 steps, you should be in a position to write up a business proposal to extend the use of video within your business, so that resources can be allocated to this function. I suggest you start with something small, which can be used as a quick win. Want to know what your face would look like wearing a certain type of make up .. without touching your face? Well you could always summon up a magin mirror with the words “Mirror Mirror on the Wall, show me my face with make up all”. And if that doesn’t work, you can head off to the Takashimaya department store in Tokyo and use their Digital Cosmetic Mirror. The Digital Cosmetic Mirror lets store patrons test makeup and recommendations without actually applying anything to their skin. Customers begin by allowing the mirror’s camera to scan their face, generating a set of customised recommendations. Using the device’s touch-screen interface, they can then ask to see specific types of makeup on their face, and the mirror paints those products on virtually and in real time. Different colours and formats can be applied and removed with the touch of a button, and consumers can print out ‘before’ and ‘after’ photos of the looks they like best. Cleverly, the printout includes purchase information which no doubt helps drive sales of the brands on offer. This video gives you a closer look.